Appearance can change rapidly with treatment and there seems little time to get your head around all the changes happening to your body. Most women purchase a wig as an immediate ‘fix’ to hair loss, (if that is going to be part of the journey ahead). A sort of ‘security blanket’ that resembles normality and a pre-treatment self. Hair after all is a big part of how most of us / our friends / family recognise ourselves in the mirror every day. I’d like to discuss some alternatives and consider dropping the pressure of having to be ‘consistent’, either with a previous appearance, or because you don’t want people to suspect a diagnosis. An understandable concern to want to be in control of that information, but I attach a testimonial below that presents an alternative experience that surprised our client AS. “I’m not a vain person but hair loss makes you feel more self-conscious, so to have complete strangers coming up to you in the street and complimenting you – well I can’t tell you what it did for my day! Friends and family are always supportive and you would expect encouraging words but this reaction to my headwear has done wonders for my self-confidence. Using hair loss as an excuse to ring the changes, rethink our style and have a little fun with colour can be liberating and / or needed distraction. Initially it may very well be about confidence, an understandable urge not to stand out any more than absolutely necessary. 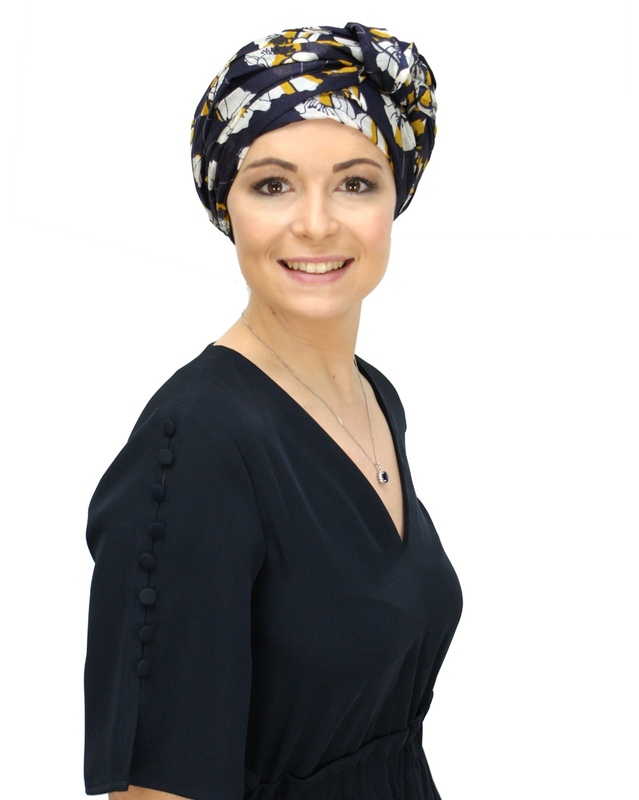 At Suburban Turban we encourage women to try on different headwear shapes; think about favourite colours; your everyday style; lifestyle situations – are you at the office or the school gate? This way you’ll find headwear to feel emotionally secure and comfortable in, so much more than just the practical considerations. Hat wearing, at times, can be like applying your favourite lipstick; with hair loss hats should help you dress to face the world. ii) If you have long hair schedule in some shorter cuts. Don’t hang on to wispy strands too long – wispy can make you look and feel worse. This ultimately hands control to you and eliminates the distress of watching it fall. 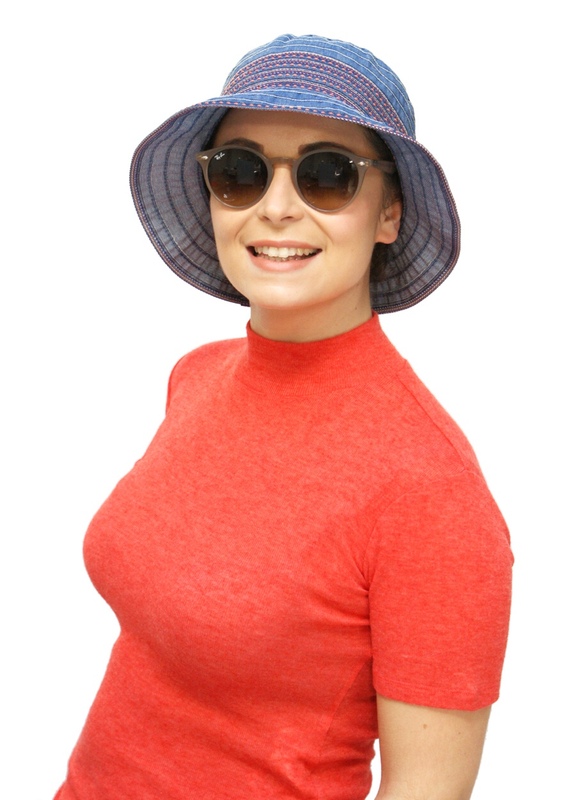 iiii) Think about your day – around the house wanting something comfy and quick to pull on, to getting to the hospital, meeting up with a friend, carrying on working, or family get-togethers – there really is a hat style for every occasion! v) What are the super easy styles to wear well? 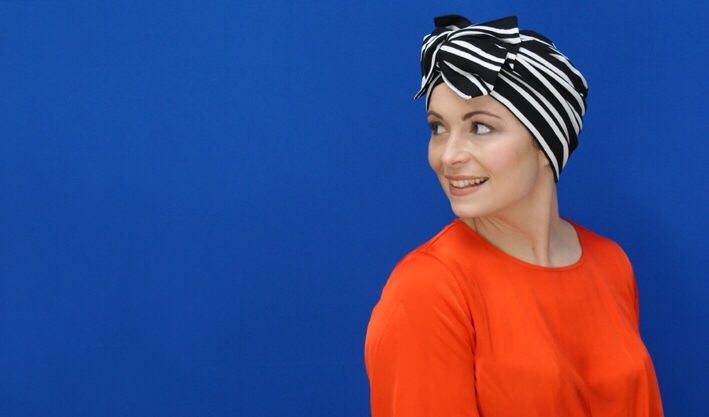 Turbans – work because they wrap the head in fabric volume, disguising defined head shape. We replace the volume of styled hair by draping fabric to create softness around the face. vi) Scarves – work well, (if you have sufficient arm movement), they wrap the head in fabric volume. Everyone can learn to tie a scarf! There are hours of YouTube (https://www.youtube.com/watch?v=9HnONC3O2WM) step-by-step scarf tying tutorials illustrating all sorts of contemporary tying styles. vii) Caps and Bucket Hats – are slightly more unusual styles for hair loss. Both look casual and can be worn either with or without a scarf underneath. 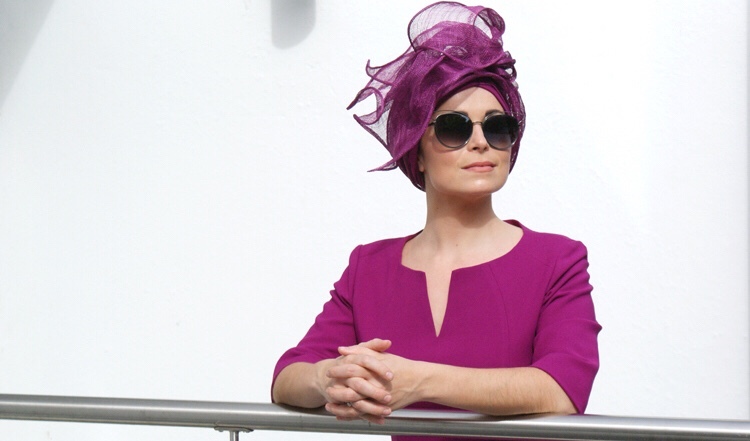 (This is a great tip for utilising any of your existing favourite hats which just fall short on coverage – a small silk square scarf can fill in the nape of the neck but not make you too hot or the look too bulky. viii) Any headwear style will be transformed if it comes in ‘your’ colours. Rich colours will lift your complexion near the face and help you look less tired. If you’ve selected hats in your favourite colours its highly likely they’ll go with whatever is in your wardrobe too – reducing early morning decision making to a minimum!